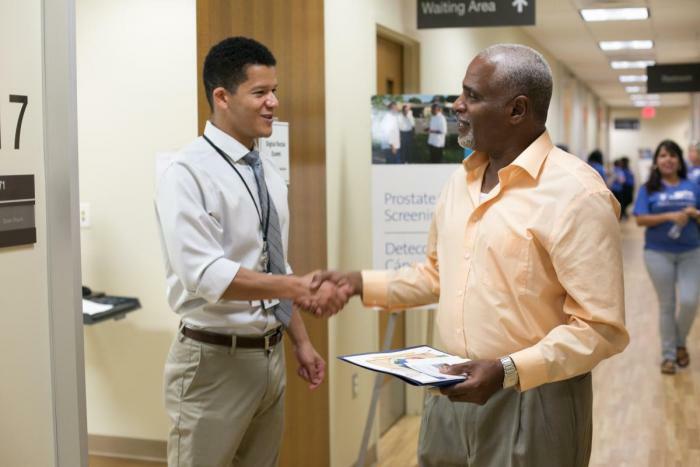 Since 2012, DCI has led an annual health fair with Duke’s Division of Urology and Duke Primary Care, called the Men’s Health Initiative. This weekend-long event is held the first weekend in September in partnership with the local FQHC, Lincoln Community Health Center. The goal of this outreach program is to provide screening services to men who are at high risk for life-threatening illnesses. The Men’s Health Initiative is intended for men between the ages of 45 and 75 who have never been diagnosed with prostate cancer or other chronic illnesses. The annual event features free on-site prostate cancer risk stratification and screening, including prostate specific antigen (PSA) and digital rectal exam (DRE), as well as screenings for hypertension, obesity, diabetes, and HIV/Hepatitis C. Local community organizations also attend the event to provide attendees with valuable information and resources that could help improve their health outcomes. Participants with concerning findings, as a result of MHI screening, are provided with a Patient Navigator that will ensure they are engaged into care and have an established medical home to address their health concerns. For more information on the Men's Health Initiative, please contact Kearston Ingraham at 919.684.6535.